But the National Police Chiefs' Council said firms had a duty to do more. The figures reveal that between 2015 and 2018 there were a total of 2,029 recorded offences - including sexual offences - where an online dating website or app was mentioned in a police report. Victims told BBC's 5 Live Investigates more should be done by the companies operating the apps to prevent predators from using them to seek out victims. Katherine's mother, Debbie, said: "They should double-check people before they let them on to these sites, it's so easy. "If Katherine had known he had a criminal record she wouldn't have gone out with him." The National Police Chiefs' Council said firms have a social responsibility to prevent abuse on their platforms. "This would assist law enforcement to concentrate resources on offenders who pose the most harm to the most vulnerable in our society." "A third of relationships start this way and 10 million people use them in the UK. It's part of our social fabric, we want to celebrate it and make sure it's safe," he said. 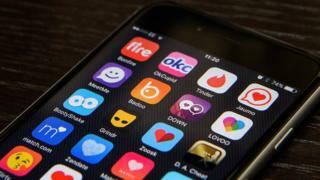 Match Group, which owns Plenty of Fish, said it uses "industry-leading automated and manual moderation and review tools, systems and processes - and spends millions of dollars annually - to prevent, monitor and remove people who engage in inappropriate behaviour from our apps". "Match Group takes the safety, security and well-being of our users very seriously - we consider it our top priority," it added. You can hear more on 5 Live Investigates at 11:00 BST on Sunday 14 April - or catch up later on BBC Sounds.